If you are concerned your 3D printer maybe creating unwanted toxic fumes in your office, home or school whilst printing filaments, you may be interested in a new 3D printer filtration system and enclosure that has been created by James Nordstrom. The 3D printer filtration system has been specifically created for 3D printing in PLA, ABS, HIPS, Nylon as well as using similar more exotic 3D printing filaments that are now being launched on a weekly basis By a wide variety of different manufacturers and are made from a wide variety of different materials to simulate wood and other surfaces. 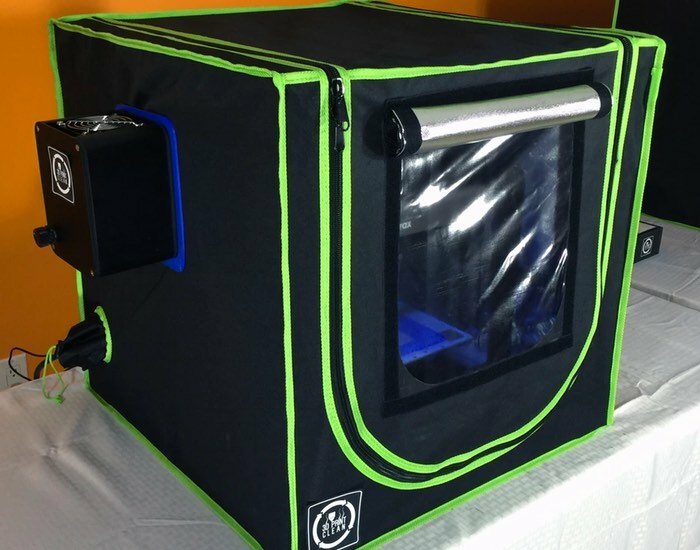 Watch the video below to learn more about this 3D printing enclosure which has been designed for printers that may be positioned in enclosed spaces, as well as helping keep the printing environment at a constant heat to reduce warping, cracking and other defects. Its creator James Nordstrom explains more about the 3D printer filtration system which he has launched over Kickstarter with the aim of raising $6,000 with pledges starting from $399 for the 600 mm version. 3D Printers operating in enclosed spaces, like schools, libraries, homes, and offices, produce fumes and concentrations of Ultrafine Particles (UFPs). These emissions can cause runny noses, irritate the throat, lungs, and head, and create long-term health problems. 3DPrintClean enclosures and filtration systems enable 3D printing in PLA, ABS, HIPS, Nylon, and other media, without external ventilation. In addition to the health benefits, enclosed printing environments improve print quality by reducing warping, curling and cracking. Taz 4/5, Ultimaker 2, Ultimaker Extended, LulzBotTaz Mini, Flashforge, Zortrax M200, ROBO 3D, MakerBot Replicator, MakerBot Replicator 2 , MakerGear Printerbot, MakerBot Replicator Mini, Witbox, Form 1, Form 2, Airwolf, UP! Plus 2, HICTOP Prusa Mendel I3, WitBox, Micro 3D, Reprap, Printrbot, Dremel, XYZprinting, Cube 3D Printer, M3D Micro 3D, DA VINCI MINI, Beethefirst, HICTOP, and the Prusa I3 3D. The inner dimensions of the Lightweight600 are 600mm x 600mm x 600mm (23.6″xx23.6″23.6″), and the inner dimensions of the Lightweight800 are 800mm x 800mm x 800mm (31.4″x31.4″x31.4″).